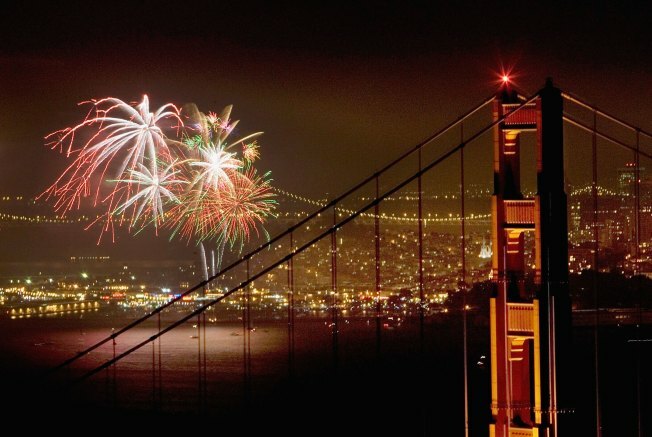 Fireworks light up the Golden Gate Bridge and San Francisco Bay on July 4, 2006. July 4th falls on a weekend this year and that means everyone has the day off. Fireworks displays should be packed to the gills and with the economy the way it is, finding one is not as easy as it used to be. Fear not -- we have you covered. Here's a list of places you can catch the evening sky action on July 4, 2010. Just click on the blue shaded links for more information. There will be a waterfront celebration at San Francisco's Pier 39 on Sunday. Enjoy free live music and entertainment starting at 3 p.m. Fireworks begin around 9:30 p.m. The show at San Francisco's Crissy Field starts around 9 p.m. But you better get there early, it's sure to be crowded. The Berkeley Marina will have free boat rides, live music and entertainment from noon-9 p.m., with fireworks off the Berkeley Pier at 9:30 p.m.
Central Park in Santa Clara will have a pancake breakfast, entertainment and live music starting at 8 a.m., with a fireworks display at 9:30 p.m.
Cupertino's celebration begins with breakfast from 7-9:30 a.m. at Quinlan Community Center, then a parade and concert at 10 p.m., music at a local school and fireworks at 9:30 p.m.
What could be more American than taking in a baseball game on July 4 weekend? You can have both at the San Jose Giants games this Friday and Saturday night. Firework displays will be lit at the conclusion of the games. There will be a country music jam, plus a fireworks show at Municipal Stadium on Sunday. San Jose State and Happy Hollow Zoo are letting folks put down a blanket and enjoy the show on the country's actual birthday. The Shoreline Amphitheatre in Mountain View is always a great fireworks show. It will have the San Francisco Symphony performing and fireworks Sunday night. You will need to buy a ticket though. Go on-board the flight deck of the USS Hornet Museum in Alameda for a view of various Bay Area fireworks at 9:30 p.m. Free live music and entertainment begins at 1 p.m. In Contra Costa County, head over to Hercules for a 4 p.m. parade and fireworks at dusk. Six Flags Discovery Kingdom in Solano County will have fireworks shows both July 3 and July 4. If you live north of the Golden Gate, Sonoma Plaza will have a parade, marching band, games, food and fireworks starting at 10 a.m., fireworks around 9:15 p.m.
Have fun everybody and Happy Birthday U.S.A.!